California is a dry state, naturally. There are bound to be wildfires from time to time. Especially as global warming continues on its path. Be that as it may, these fires are extremely dangerous and create a path of destruction that would rival the tsunamis in Japan. As the local population recovers from this ordeal, there are many who are wondering what steps will be taken to protect them and their homes in the future. With the evolution of technology, there are continuing to be great strides in the exploration of, the prediction of, and the demolishing of these wildfires. Below are three areas technology is helping authorities gain the upper hand in the battle against drought and the fires it causes. One of the first things that you need in order to solve any problem is to be able to look at it from every possible angle. Being able to do so helps you see all possible causes of the problem and anything that may be helping the problem along. Most of all, it allows you to possibly see answers to the problem you might not see otherwise. Technology is offering a helping hand. Drones are allowing firefighters to see further into the fire and to have a larger aerial view. Workers are donning head cams, as well. These help responders build better maps of the area the fire is covering. They also contain sensors that keep track of the wind speed, temperature, and barometric pressure. These are, in turn, sent back to a central command center that works with everyone involved to get the upper hand on the fires. The same technology that is assisting firefighters in being able to see the fire may also help them to predict where it will head next. 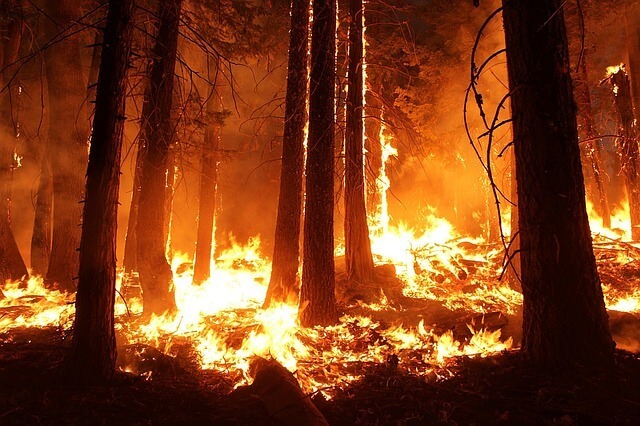 Over the years, scientists have spent time studying the patterns of forest fires. Most people think that a monstrous wildfire is more unpredictable than what words will escape President Trump’s lips next. It’s simply not true. As science began to chart the waves of heat from each fire, they began to notice a pattern. Wildfires act much like a severe storm. There are certain conditions that make having one favorable like the combination of a drought, a severe heat wave, and assisting winds. Much like a thunderstorm, once a fire gets going, it begins to feed itself by consuming tinder and natural fuel and creating its own winds. Technology is helping California fight this danger by measuring these atmospheric conditions and using the information to predict future fires like a meteorologist would predict the weather. When it comes to actually fighting the fire, the technology used may not be newly invented, but it is still quite ground-breaking. Literally. One of the first things firefighters do is to create a firebreak. This is where bulldozers are used to make a line around the fire where all possible fuel to the fire is removed. The hope is that without fuel, the fire will simply burn out. Our dedicated firemen and women also use ever water hose they have. The trick is to surround the fire by placing trucks at regular intervals around the blaze so firefighters can attack a line of the fire simultaneously. Another technological wonder, the helicopter, is used to carry loads of water or chemicals that make natural burn sources flame retardant and drop them in hot spots. The wildfires of California have been a devastatingly regular occurrence. It is the hope of many that technology will eventually eliminate the possibility of a wildfire, but until then it is definitely making great progress in the detection and eradicating of this danger.